Homer’s lead water distribution and wastewater collection operator has earned a top honor for his work with the city. Richard Klopp was named Wastewater Operator of the Year by the Alaska Rural Water Association. 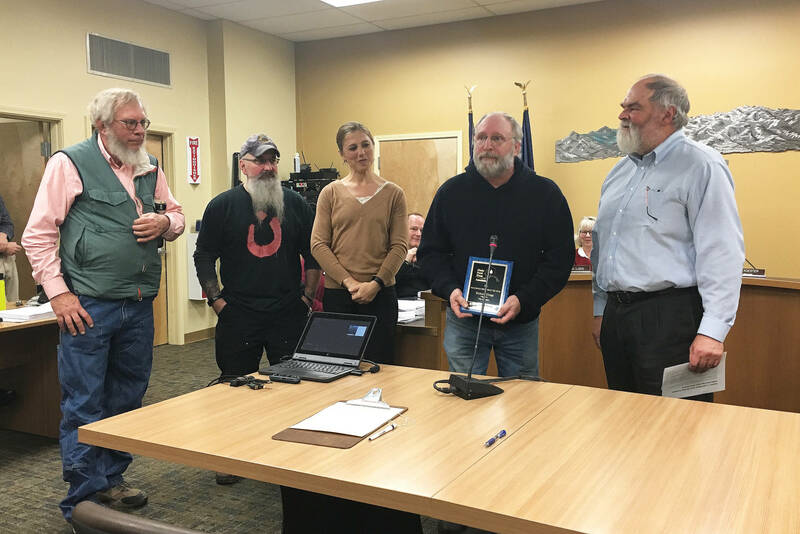 Members of the Homer City Council and city employees celebrated Klopp’s achievement with a recognition at the Nov. 26 council meeting. Klopp has been a lead operator in Homer for the last five years. Since then, he’s made “major” improvements to the city’s distribution and collections system preventative maintenance program, according to the city website. This includes “smoke testing the collection system to quickly detect and repair structural damages, leaking joints and other problems in sewer pipes,” according to the site. Klopp had few words after accepting his award. “I have a really good team that we work with, and makes it all possible,” he said. This isn’t the first time Homer has been recognized for its water and wastewater systems. Water and Sewer Superintendent Todd Cook was named Wastewater Operator of the Year for a population of more than 1,000 last year. The city was also recognized that same year for Source Water System of the Year for a population of more than 1,000. The city’s drinking water comes from the Bridge Creek Reservoir near Skyline Drive. Homer takes proactive measures to protect the watershed through a source water protection plan. Cook told the Homer News last year that this plan was on file with the Alaska Department of Environmental Conservation before such a plan was even required by the state of Alaska.